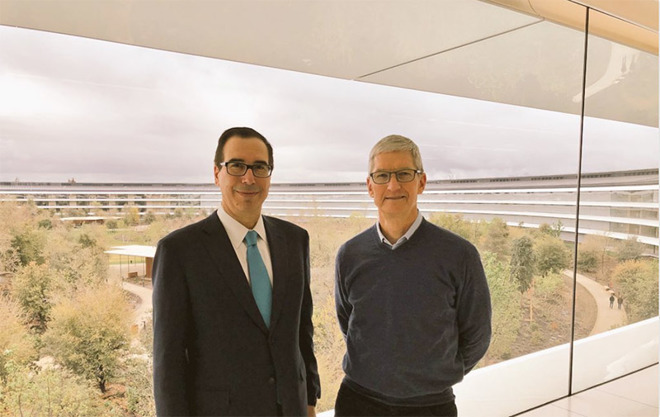 U.S. Treasury Secretary Steven Mnuchin met with Apple CEO Tim Cook at the company's newly opened Apple Park campus in Cupertino, Calif., on Friday, where he touted the firm's $350 billion "commitment" to America. A separate report notes Saudi Arabia's Crown Prince Mohammed bin Salman is planning to meet with Cook and other tech executives later this month. Why Mnuchin was at Apple's headquarters is unknown, though Trump's cabinet member did take time out of his day to post a missive about the meetup with Cook to Twitter. "Glad to visit @Apple HQ with @tim_cook. Thank you for your commitment to invest 350B in USA! #TaxCutsJobsAct," Mnuchin's tweet reads. In January, Apple outlined plans to pump some $350 billion into the U.S. economy over the next five years. The company in a statement said it expects capital investments in manufacturing and a "record" tax payment upon repatriation of overseas profits to account for approximately $75 billion of the infusion. On the topic of Apple's growing overseas cash pile, long a bone of contention for lawmakers, the company said it estimates domestication activities will amount to a tax payment of $38 billion. Apple claims the huge tax fee will be the largest ever made. Mnuchin references the recent passage of Trump's tax bill, which reduces repatriation rates for large corporations, as a driver of Apple's decision to invest in the U.S. While Apple announced its intent prior to the law's passage, Cook in a subsequent interview said tax policy changes in part allowed for the huge capital commitment. Citing sources familiar with the matter, Bloomberg reports Saudi Crown Prince Mohammed bin Salman plans to visit the heads of major technology companies as part of his first trip to the U.S. since becoming heir to the throne. Apple's Cook and Google executives are said to be on the list of hosts, the report claims. Along with tech industry moguls, Prince Mohammed is expected to speak with President Donald Trump and other top U.S. officials in Washington, D.C., next week on a whistle-stop tour that includes visits to New York, Boston, Los Angeles, San Francisco and Houston. What Prince Mohammed plans to discuss with Cook and company is unknown, though sources claim the Saudi heir will meet with movie executives in Los Angeles as he forwards plans to bring commercial cinema to his country for the first time in over 35 years. Prince Mohammed made headlines this week when a report came out claiming he has been blocking his mother, Princess Fahda bint Falah Al Hathleen, from seeing his father, King Salman, for more than two years. According to NBC News, the prince has kept his mother's whereabouts a secret in a bid to amass power. Citing intelligence operations, unnamed U.S. officials believe Prince Mohammed is concerned his mother opposes his ascendancy to the throne, prompting him to conceal her location. Editor's note: Due to the political nature of this article, comments have been disabled.